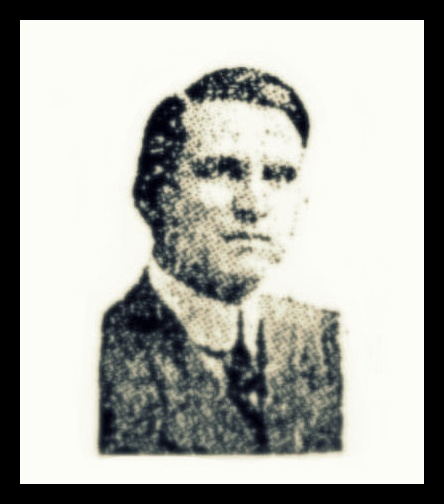 Francis Marion Burkhalter (1886-1918), of Ray City, GA.
Francis Marion Burkhalter, the eldest son of Isaac Burkhalter, Jr. and Marentha Sirmans, was born December 3, 1886 in Rays Mill (now Ray City, GA). His father, Isaac Burkhalter, Jr (1863 – 1918) was a farmer of Ray’s Mill, with a 50 acre farm on Lot No. 422, 10th District. 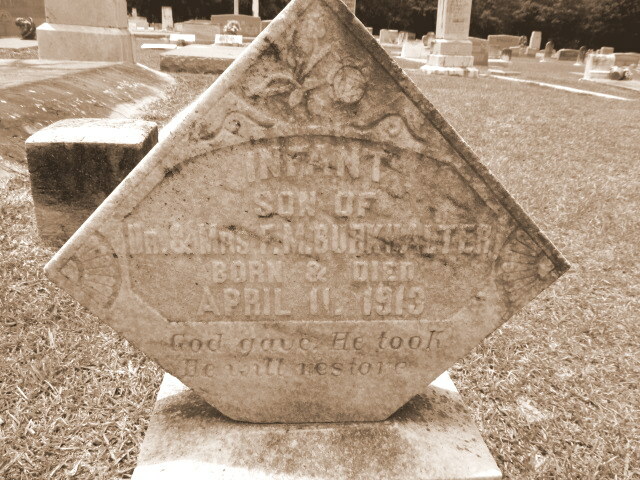 His grandfather, Captain Isaac Burkhalter, was killed at the Battle of Gettysburg while in command of Company G “Clinch Volunteers”, 50th Georgia Regiment. His mother, Marentha Sirmans, was a daughter of Benjamin J. Sirmans and Nancy A. Shaw. Francis excelled at studies. He attended the Atlanta College of Medicine, and by the age of 22 had completed a degree in Medicine. He returned to Ray City and set up practice in 1909, joining the other medical professionals of Berrien County. 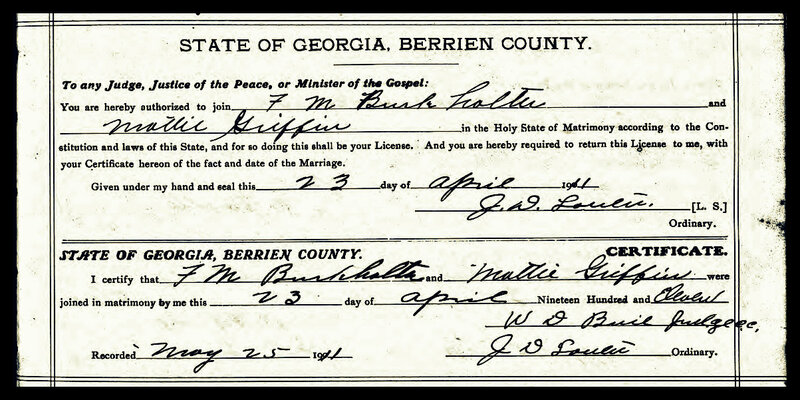 On Sunday, April 23, 1911, F. M. Burkhalter and Mattie H. Griffin were married by Judge W. D. Buie. Mattie and her cousin Mary Griffin operated a millinery store in Nashville, GA. She was a daughter of Kiziah Lenora Knight and Elbert J. Griffin, granddaughter of John and Sarah Knight, and grandniece of General Levi J. Knight. That September, 1911, Dr. Burkhalter moved his practice to Howell, GA, about 24 miles southeast of Ray City ( 13 miles due east of Valdosta) in Echols County. A drugstore at Howell was operated by Benjamin Franklin Rentz, brother of Dr. Lyman U. Rentz who later practiced medicine at Ray City, GA. In the spring of 1913, a son was born to Francis Marion and Mattie Griffin Burkhalter, April 11, 1913. But tragically the infant died that same day. Francis and Mattie took their baby home to Ray City to be buried at Beaver Dam Cemetery. After two years in Howell, Burkhalter returned to Ray City to resume his practice there. The Medical Association of Georgia places Dr. F. M. Burkhalter at Ray City in 1917, along with Dr. Lawson S. Rentz. The Nashville doctors at that time were Dr. William Carl Rentz and Dr. Guy Selman, formerly of Ray City. Reuben Nathaniel Burch was a doctor at Milltown. On June 5, 1917, Francis Marion Burkhalter and his brothers, William Thomas Burkhalter and John Allen Burkhalter, all completed their registration for the draft for the American Expeditionary Forces in Europe, their registration cards being completed by Lyman Franklin Giddens and Charles Oscar Terry. William Thomas Burkhalter had returned to Berrien County to register for the draft. At the time he was working in Jacksonville, FL as a salesman for the John G. Christopher Company. John Allen Burkhalter went on to become a veterinarian and lived in Ray City for many years. F. M.Burkhalter’s physical description was given as age 30, medium height and build, with blue eyes and brown hair. With America’s entry into World War I, Dr. Burkhalter was called into service, along with many other men of Berrien County. Dr. Lawson Rentz went to Camp Wheeler, then to the Embarkation Service in New Jersey. Dr. Guy Selman was sent to Camp Jackson, SC. Dr. Gordon DeVane was busy treating the victims of Spanish Influenza at home in Berrien County; he was commissioned a first lieutenant in the Medical Reserve Corp, but died before he was deployed. In the summer of 1918 William T. Burkhalter, brother of Francis M. Burkhalter, entered the Veterinary Corps and served with Veterinary Hospital #16. Dr. F.M. Burkhalter entered active service on March 25, 1918. He was sent to Fort Oglethorpe, then by July 19, 1918 he shipped overseas to France with the American Expeditionary Force as a 1st Lieutenant in the Medical Corps. Dr. Burkhalter was with the medical detachment of the 50th Engineers, serving in the Defensive Sector and in the Meuse-Argonne campaign. The Meuse-Argonne Offensive, also known as the Battle of the Argonne Forest, was launched late on the night of September 25, 1918. American reinforcements in transit to Europe included hundreds of Georgia soldiers, dozens from Berrien County, who went down with the ill-fated troopship HMS Otranto off the coast of Islay, Scotland on October 6, 1918. Among the Otranto dead were Ray City residents Ralph Knight, and Shellie Lloyd Webb. Arriving U.S. reinforcements were strengthening the Allied advance, but by this time the influenza epidemic was also beginning to spreading across the battlefields. Sammie Mixon of Allenville, GA, who was fighting in the Meuse-Argonne with Company “H”, 18th Regiment, First Division, was wounded in action and died from pneumonia a few days later. Bill Sapp died of bronchial pneumonia on October 6, 1918. Levi D. Clements of Ray City, serving with the 64th Artillery CAC contracted influenza and broncho-pneumonia and died October 11, 1918. In the early morning hours of October 8, 1918 Isaac R. Boyett, of Adel, GA was fighting with Company C, 328th Infantry in the Meuse-Argonne Offensive near the the French town of La Forge when he was severely wounded by machine gun fire. Later that same day, Boyett’s regimental mate, Alvin C. York, earned the Medal of Honor for his actions in capturing 132 German soldiers at the village of Châtel-Chéhéry. Boyett died of his wounds two days later. Carlie Lawson also fought in the Battle of the Argonne Forest with Company G, 11th Infantry; he returned from the war and lived to be 100 years old. Rossie O. Knight, of Ray City, served with Company C, 1st Division Ammunition Train in the Meuse-Argonne Offensive; he was gassed during the war and never fully recovered. Shortly after the Meuse-Argonne Offensive was launched Dr. Burkhalter became a patient himself, contracting lobar pneumonia probably as a secondary infection resulting from influenza. He was apparently admitted to Base Hospital No. 15, located at Chaumont, France, about 160 miles east of Paris. F. M. Burkhalter died at Base Hospital No. 15, Chaumont, France, on October 8, 1918. Of the 4,743,826 U.S. troops serving in WWI, 34,446 died from influenza-pneumonia and another 28,794 died of other diseases or accidents, totaling more than the 53,513 who died as a result of battle. It was November 4, 1918 before Mattie Burkhalter would be informed of her husband’s death. A telegram from the War Department, received by Mrs. F.M. Burkhalter, of Nashville Monday, announced the sad news of the death of her husband, Lieut. Frances Marion Burkhalter. Dr. Burkhalter left for France last July, arriving at his destination “somewhere in France” on July 20th. The telegram stated that he died of lobar pneumonia on the eighth of October. The news came as a great shock to Mrs. Burkhalter, who before her marriage, was Miss Mattie Griffin, a daughter of the late Rev. Elbert Griffin, and was the climax to a long series of trying experiences. For several weeks she has been in Ray City ill with influenza and during this time her deceased husband’s father, Dr. Isaac Burkhalter, has died, while Mrs. Burkhalter, Sr., is even now so ill with pneumonia that she is not expected to live. The telegram containing the news of her husband’s death reached her Monday upon her arrival in Nashville from Ray City. She was one her way to Albany to make her home with her mother, Mrs. Griffin. Dr. and Mrs. Burkhalter were married about eight years ago and until the fall of 1917 they lived in Ray City, where Dr. Burkhalter practiced medicine. Moving to Nashville, he practiced here until the call of his country came and he left to join the colors last spring. He was 32 years of age. Besides his wife are surviving him his mother, two sisters and one brother at home and one brother, Lieut. W.T. Burkhalter, who has just arrived in Siberia where he serves. 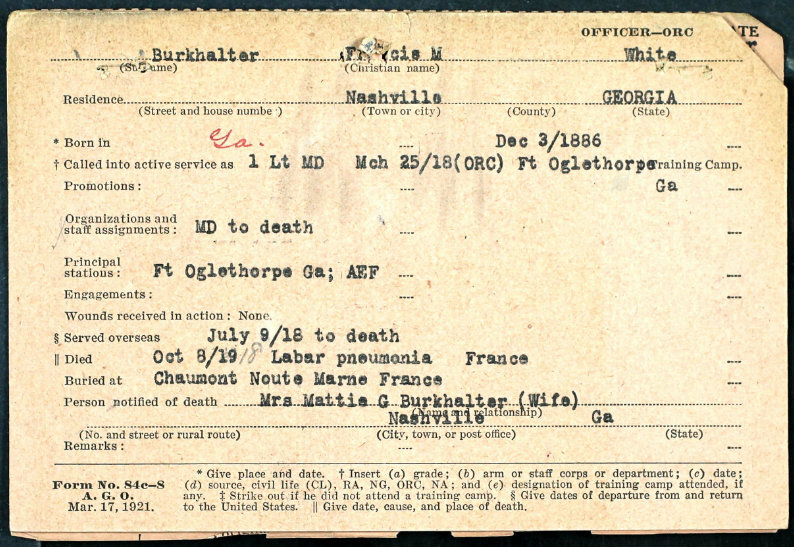 The WWI service record of Francis Marion Burkhalter documents his entry into the Medical Corps, deployment to France, death and burial. He was buried in the American Cemetery at Chaumont, France, about 160 miles east of Paris. His was one of about 573 American graves at Chaumont. “…the shady road to Neufchateau, curv[es] down the long hillside into the valley of the Marne. At the foot of the hill is the mossy wall surrounding St. Aignan’s Cemetery, with the facade and tower of the ancient church, as old as St. Jean’s itself, half hidden behind the tombstones and the trees growing among them. Beside the wall a by-road leads down toward the Marne where, on a sheltered little plateau above the stream, lies a spot more sacred to the soldiers from the New World than any other in Chaumont—the American Military Cemetery. Slumbering in the deep peace of the valley, here lie buried 545 officers and soldiers of the United States Army and among them a few faithful nurses and welfare workers. 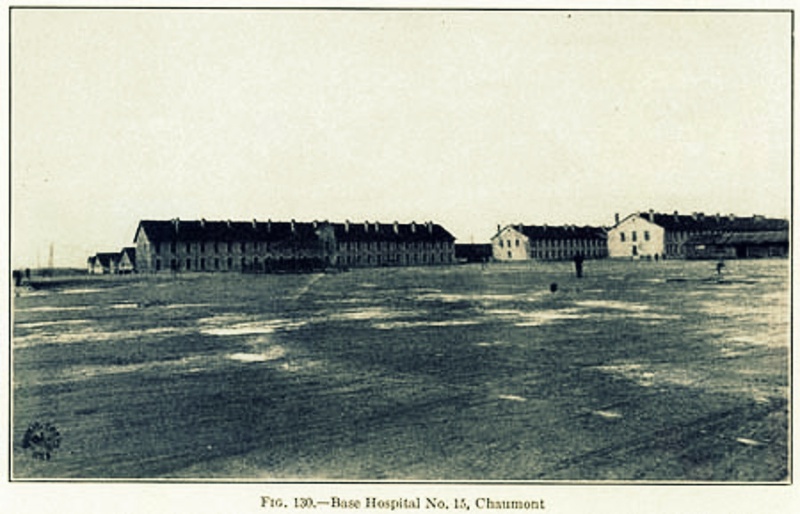 Some of them died in the camps in and around Chaumont but most of them of wounds or disease at Base Hospital 15. The location and surroundings of the cemetery are most appealing. Close beside the parish cemetery it lies, the shadow of St. Aignan’s stretching across it in the afternoon and the soft tones of her bell floating over it at matins and vespers. Here, with the peculiar tenderness of the French for the places of the dead, come often the people of Chaumont, impartially bestowing their attentions upon these graves of allies and upon St. Aignan’s sepulchres; planting and tending the flowers around the mounds or hanging upon the white crosses at their heads some of those pathetic funeral wreaths of beadwrought flowers and leaves which are the universal tokens of mourning in the cemeteries of France. How much better that they should lie there forever, marshaled with the comrades of their faith and watched over by the kindred people to whose aid they came in the hour of bitter need, than that their dust should be exhumed and sent across the ocean to be scattered in the private cemeteries of city and village and countryside, inevitably to be at last neglected and forgotten! For here they may rest, as the dead in America’s other war cemeteries in France may rest, still active factors for the good of the world as everlasting symbols of the union of free peoples in a high cause. 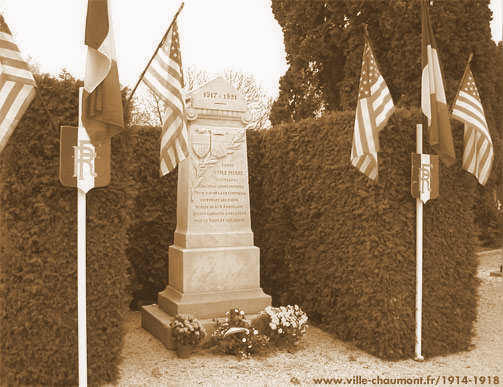 Certainly to Chaumont, knowing scarcely a single American before the great war, the cemetery beside St. Aignan’s is a bond of sympathy with the people and the institutions of the United States more strong and abiding than the most imposing monument. So, as the lights twinkle out among the trees of the hilltop city and evening with its deep peace comes down over the valley where the fragrance of wild flowers and mown fields drifts above the serried graves and the waters of the immortal Marne whisper at their feet, let us leave both Chaumont and them, assured that here among the hills of the High Marne, fallen comrades and living friends have together reared a shrine to which the feet of Americans will come generations after the last soldier of the World War shall have received his discharge from the armies of earth. By 1920, Mattie Burkhalter had moved back to Ray City with her widowed mother. Her mother-in-law, Marentha Burkhalter, survived the pneumonia and continued to reside on the Burkhalter farm at Ray City. Mattie and her moter made their home next to Francis’ mother and brother, John Allen “Tete” Burkhalter. After the war Tete Burkhalter became a veterinary surgeon at Ray City. 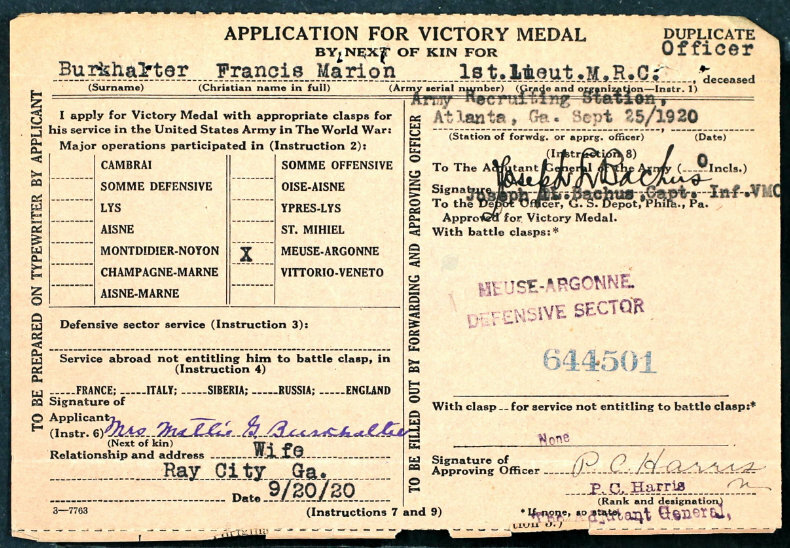 In 1919, the United States Army authorized the Victory Medal in recognition of service in World War I. Mattie Burkhalter submitted an application for a Victory Medal for her deceased husband. F. M. Burkhalter, Eugene Rudolph Knight, Leon Clyde Miller, William B. Register, Henry Watts and Rossie O. Knight were among the Ray City men receiving the award. Despite the tender care shown the WWI dead by the town of Chaumont, France, the grieving families in America were desirous that the bodies of their loved ones should be brought home to rest. In 1921, the bodies in the American Cemetery, including the body of F. M. Burkhalter, were exhumed and returned to the States. The citizens of Chaumont erected a monument to mark the sacred ground where the fallen American soldiers had briefly rested. Beside the road just in front of St. Aignan’s chapel is the site of the American Cemetery, which lay something like two years beside the older French Parish cemetery. The remains of Francis Marion Burkhalter was returned to Ray City, GA and re-interred at Beaver Dam Cemetery. 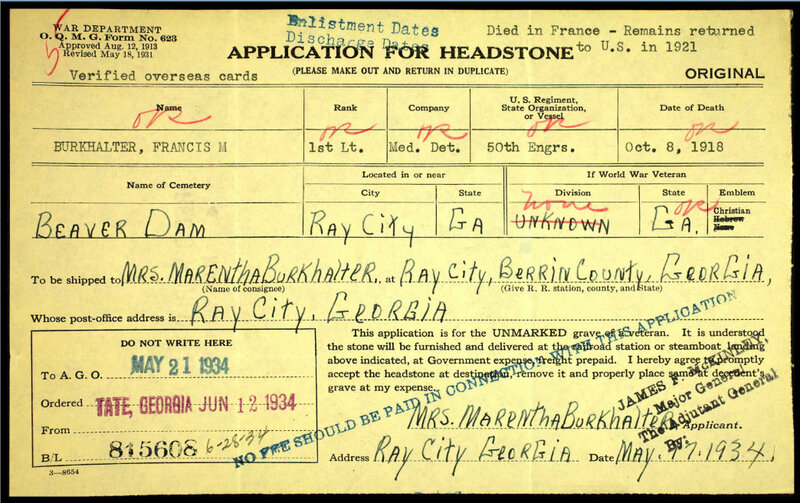 In 1934, Mrs. Marentha Burkhalter applied for a military headstone to mark his final resting place. 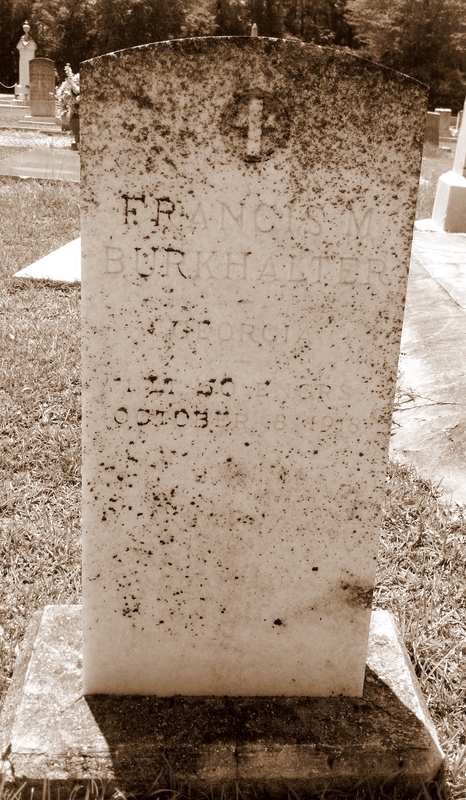 Application for a military headstone for the grave of Francis Marion Burkhalter.